« Salsa Saturdy at Normandy Fountain – FREE! Although ALL of participating restaurants are sold out, you can still be a part of this magical evening. 3. Dine in at a restaurant along the Ave. & enjoy as the evening event unfolds before you! Join us for the 11th Annual Savor the Avenue along Atlantic Avenue in Downtown Delray Beach, Monday, March 25th, 2019. One of the hallmarks of South Florida’s high season is its most celebrated culinary event: Savor the Avenue. 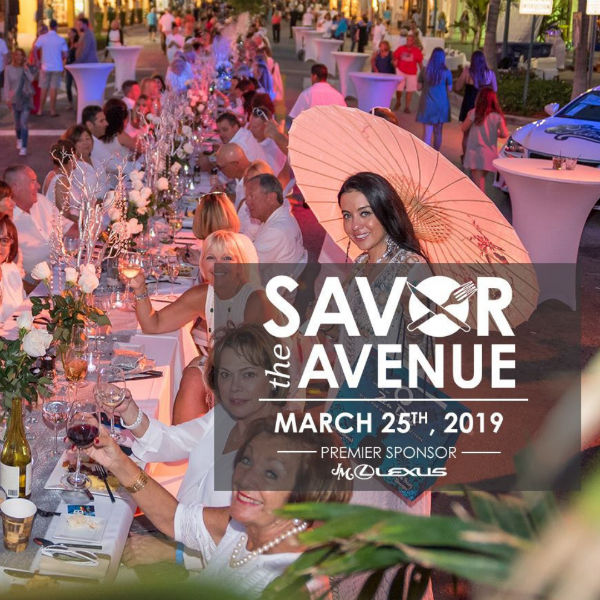 On Monday, March 25th, Delray Magazine, Boca Magazine, and the Delray Beach Downtown Development Authority, once again host the Savor the Avenue event, now in its 11th year, where 1,100 guests will dine at 1,320 foot dining table that spans five blocks along East Atlantic Avenue. This year, Healthier Delray Beach will be the beneficiary of proceeds raised, as each guest’s reservation includes a $3 contribution to this local non-profit. Reservations are to be made with the individual restaurant and are available beginning FEB. 1, 2019! **Promote this event to 7,000 eNewsetter subscribers. Must Call 561-271-8210.